If the axiom of a picture being worth a 1,000 words is true, the BEA promo piece that is pictured below is worth 10,000 words. BEA is a lot of things to a lot of constituents, but this image highlights all that is going on around BEA, with the show itself being the centerpiece that pulls everything together for a singular experience. I have stated one of my fears for BEA was being the jack of all trades and master of none. 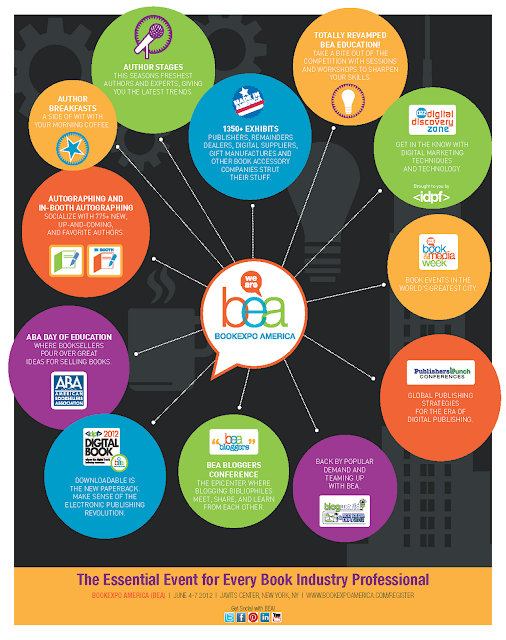 This poster highlights how BEA's partnerships with the IDPF, PublishersLaunch and the BEA Bloggers Conference as well as the ABA & AAP deliver the Masters of their respective trades for those audiences while allowing them to take in the full BEA experience, making it the Essential Event for Every Book Industry Professional. I am partial, but I love this image!! It is a simple visual that provides the the depth of opportunity that is BEA which almost defies explanation by words alone.